Please join us today in Gowanus for the catalog launch and closing reception of Spine at Ortega y Gasset Projects! A review by the Brooklyn Rail is now online. Come meet the curators, artists, writers and publisher involved with this expansive and beautiful exhibition. Poetry readings by Mònica de la Torre and Wayne Koestenbaum will illuminate the gallery at 4:30 pm. My broadsheet, Enter Stage Left (Monday’s image, v. 1), is on view and will be available for purchase at the gallery, and via Space Sisters Press. 3:00 pm: Walk-through with The Skirt's exhibition artist Adam Liam Rose. Reception to follow | Catalogs will be for sale at the event. SPINE is a group exhibition curated by artist Suzanne McClelland and OyG Co-Director and artist Leeza Meksin, featuring works by Cati Bestard, Lisa Blas, Sonia Louise Davis, Shoshana Dentz, Anne Eastman, Jenny Monick and Anne Vieux. SPINE explores the mental and physical structures of a book and questions what is legible, optical, physical, emotional or cerebral. Reading is viewing and occurs any time anyone engages with visual art but it also happens when we’re handling and engaging with books as objects. Printed media lives in the realm of the physical and the private with a spine functioning as an interruption, an intersection, a fulcrum and a central structure, often simultaneously. The works presented in this exhibition question what is shared when the private act of reading becomes public. 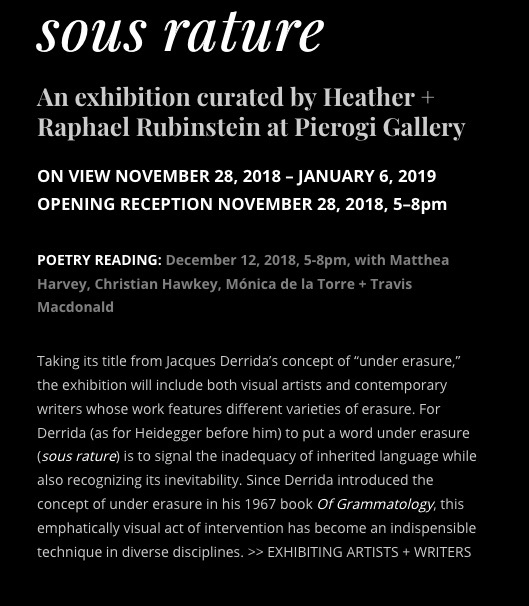 For the opening of Under Erasure, curated by Heather + Raphael Rubinstein at Pierogi Gallery. The curators have designed a beautiful website featuring the curatorial text and work of all artists/writers/collaborators. The exhibition will be on view through January 6, 2019. (Catalog available).